What Is the Tarsal Tunnel? The tarsal tunnel is a narrow space that lies on the inside of the ankle next to the ankle bones. The tunnel is covered with a thick ligament (the flexor retinaculum) that protects and maintains the structures contained within the tunnel—arteries, veins, tendons, and nerves. 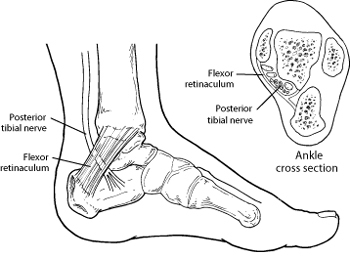 One of these structures is the posterior tibial nerve, which is the focus of tarsal tunnel syndrome. Tarsal tunnel syndrome is a compression, or squeezing, on the posterior tibial nerve that produces symptoms anywhere along the path of the nerve running from the inside of the ankle into the foot. Tarsal tunnel syndrome is similar to carpal tunnel syndrome, which occurs in the wrist. Both disorders arise from the compression of a nerve in a confined space. A person with flat feet is at risk for developing tarsal tunnel syndrome, because the outward tilting of the heel that occurs with “fallen” arches can produce strain and compression on the nerve. An enlarged or abnormal structure that occupies space within the tunnel can compress the nerve. Some examples include a varicose vein, ganglion cyst, swollen tendon, and arthritic bone spur. An injury, such as an ankle sprain, may produce inflammation and swelling in or near the tunnel, resulting in compression of the nerve. Systemic diseases such as diabetes or arthritis can cause swelling, thus compressing the nerve. Symptoms are typically felt on the inside of the ankle and/or on the bottom of the foot. In some people, a symptom may be isolated and occur in just one spot. In others, it may extend to the heel, arch, toes, and even the calf. Sometimes the symptoms of the syndrome appear suddenly. Often they are brought on or aggravated by overuse of the foot, such as in prolonged standing, walking, exercising, or beginning a new exercise program. It is very important to seek early treatment if any of the symptoms of tarsal tunnel syndrome occur. If left untreated, the condition progresses and may result in permanent nerve damage. In addition, because the symptoms of tarsal tunnel syndrome can be confused with other conditions, proper evaluation is essential so that a correct diagnosis can be made and appropriate treatment initiated. The foot and ankle surgeon will examine the foot to arrive at a diagnosis and determine if there is any loss of feeling. During this examination, the surgeon will position the foot and tap on the nerve to see if the symptoms can be reproduced. He or she will also press on the area to help determine if a small mass is present. Advanced imaging studies may be ordered if a mass is suspected or if initial treatment does not reduce the symptoms. Studies used to evaluate nerve problems—electromyography and nerve conduction velocity (EMG/NCV)—may be ordered if the condition shows no improvement with non-surgical treatment. Rest. Staying off the foot prevents further injury and encourages healing. Ice. Apply an ice pack to the affected area, placing a thin towel between the ice and the skin. Use ice for 20 minutes and then wait at least 40 minutes before icing again. Oral medications. Nonsteroidal anti-inflammatory drugs (NSAIDs), such as ibuprofen, help reduce the pain and inflammation. Immobilization. Restricting movement of the foot by wearing a cast is sometimes necessary to enable the nerve and surrounding tissue to heal. Physical therapy. Ultrasound therapy, exercises, and other physical therapy modalities may be prescribed to reduce symptoms. Injection therapy. Injections of a local anesthetic provide pain relief, and an injected corticosteroid may be useful in treating the inflammation. Orthotic devices. Custom shoe inserts may be prescribed to help maintain the arch and limit excessive motion that can cause compression of the nerve. Shoes. Supportive shoes may be recommended. Bracing. Patients with flatfoot or those with severe symptoms and nerve damage may be fitted with a brace to reduce the amount of pressure on the foot. Sometimes surgery is the best option for treating tarsal tunnel syndrome. The foot and ankle surgeon will determine if surgery is necessary and will select the appropriate procedure or procedures based on the cause of the condition.